BW ClubHouse Where Are We? Tools would be on loan during the class with the option to purchase from Priyanka. 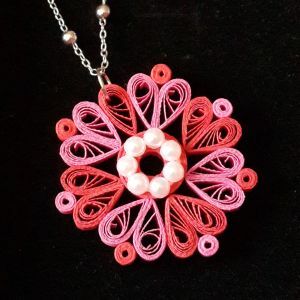 We will be introduced to paper quilling – from the tools, type of paper used, the different shapes and how those ‘shapes’ can be put together to form a beautiful pendant. By the end of the night, not only would we have ideas on how to use quilling for various accessories and decorations, we would have made our very own pendant. The possibilities are endless! A self taught paper artist specializing mainly in the art of paper quilling, Priyanka has been a full time quilling trainer and designer for the past 2 years under her brand name Just Love Crafts (JLC). She works with various organisations to spread DIY and making cultural and designs functional products with paper which are not just aesthetically appealing but extremely useful too. To know more about Priyanka, visit her blog.